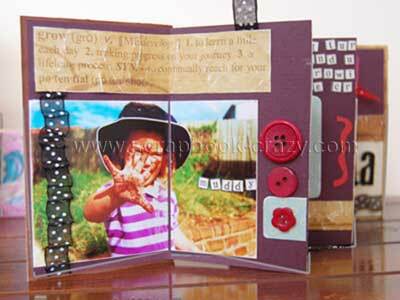 Learn How to make a scrapbook mini album or mini scrapbook. Traditional 12x12 Scrapbook layouts are great!! But I love making hand made mini scrapbooks, mini books and other scrapbooking projects. WHY??? All I have to do is pick the type and size of scrapbook mini album I want to make, choose an album theme to suit the photos I want to scrap, grab a bunch of embellishments and away I go. By the end of the day (hopefully) I will have in my hot little hands one completed scrapbook album. Unlike my traditional 12"x12" album which would take me forever to finish. Especially since I find I don't have nearly as much time to scrap as I would like. With this in mind they are a great way to get started in scrapbooking. The pages are much smaller, so they need less embellishments, time and creative energy to create. I don't know about you, but to me the thought filling a album with 20 odd 12x12 layouts was really overwhelming when I was a first time scrapper. In fact I still haven't filled my first family album yet, one day..... With a mini album you can finish it in a snap and you get to feel a huge sense of accomplishment when you see the finished product. Especially when they look as good as they do! Mini albums make fantastic scrapbooking gifts for friends or family that they'll love and treasure always. Because My grandmother lives in NZ and we're here in Australia, instead of sending her photos I send her a mini book portraying the previous year or maybe the photos from a holiday that we shared together like this Summer holiday photo album. I showcase only the best photos of any of the major events that occurred. If there one particular stand out event that deserves extra attention - like my daughters first birthday - then I will make her a special album. My grandmother will cry her eyes out whenever she receives one - then proceed to show it off to anyone who walks through her front door. My favourite gift of all time to give is a baby shower mini scrapbook, usually made from plain old paper bags. Oh my god, do the mummies just love them, even the other guests at the party love to pass it around and "oooh and ahhh" Good practice for when the baby comes I guess. I'm also into making wedding guest books for my friends to compliment their invitations. Take a look around the Mini album Gallery for pictures and hint and tips on how to make some of these cool mini books. We are adding new albums from our readers weekly so you will always find something new. To keep up to date when new albums are added you may want to subscribe to our blog or maybe sign up for the free newsletter which is always chocka block full of new ideas, freebies, the odd competition and other great mini album stuff. To sign up for the newsletter look up in the top right hand corner. So if you're thinking of giving mini scrapbook albums a go, check out a few instructions for scrapbook mini album that you can try. If you think that you might like to try something a little different like altering a chest of draws with your scrapbooking supplies, making your own custom clock to suit the decor of your home or even making your own birthday party decorations and centrepieces. then you might want to see what we have to offer in our Altered Art scrapbook projects section of the site. There is something for everyone I'm sure you'll agree. Whats New: Check out the latest mini album additions to Scrapbook Crazy. Mini Album Shoppe: Grab a few scrapbooking products. Mini Album Blog: Need more creative mini album ideas and altered art projects. Mini Album Tutorials: Instructions, templates to create your mini books. Mini Album themes: Scrapbooking themes to suit any occasion, person or holiday. Scrapbook Projects: Off the page scrapbooking projects. Mini Album Gallery: If you just like to look at the pictures then go straight to the gallery. Paper Bag Album Instructions: Make your next paperbag album. Online mini albums: send free mini scrapbooks to your mates with smilebox. Altered Books: Make an altered book or two. Find some altered book techniques to try. ABC Albums: Make an ABC themed mini album. Make a Calendar: Create fabulous calendar presents. CD Holder Mini Album: Make a CD mini album. Contact Me: Let us know what you think. What would you like us to include on this website. More Free scrapbooking mini album ideas: Subscribe to our free e-zine - mini albums to go. Scrapbook Kits: thinking of trying a mini album kit. Scrapbooking Glossary: Definitions of some of the more common scrapbooking terms. Scrapbooking Tools: Check out some of the more needed scrapbooking tools. Mini Album Links: Check out some neat websites that I have found great resources on.